This week’s pick had a lot riding on it. Two weeks ago, I led the Burger Tour to Marty’s, which as it turns out, closed at 5PM every day (WTF?!). Just my luck – and I even bothered to call just to make sure they were still in business. Boys and girls, make sure you check the hours, too. So, this week, I took Burger Tour preparation to another level, folks. 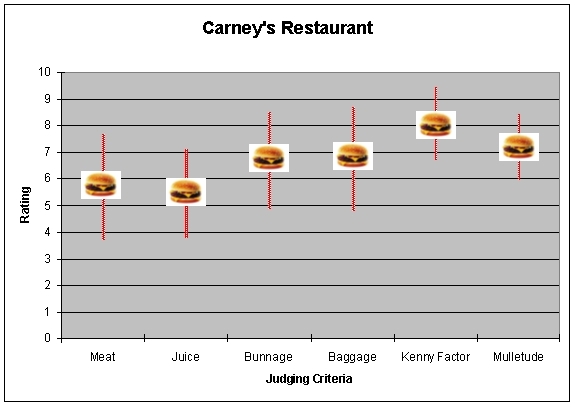 I actually SCOUTED out Carney’s Restaurant before selecting it as this week’s pick. I got up on Saturday morning, drove out to West Hollywood to the famed train car that is Carney’s, and sat down to have one of their “best hot dogs in the world.” They were pretty darn good I must say. So, I figured the burgers must be on par as well. Then, I actually asked the people behind the grill what the hours were on Wednesday and took note of the parking situation. This, ladies and gentlemen, is how much I love all of you Burger Tourists. Nothing but First Class for you guys. Carney’s says it has “probably the best hamburgers and hot dogs… in the world.” The Burger Tour would be the judge of that. The buns were about average – kind of hard to screw this one up. “Excellent chardonnay. $4 box wine… mmmm.” On this note, another tourist ordered a merlot – the guy brought over a glass and topped it off until it was practically spilling over the sides. Not bad. Not bad. No complaints here. The service was fast. Finally, this was the most highly attended Burger Tour location to date, and it was quite a long drive. Respect our dedication – love the burger. The atmosphere itself was fairly interesting. I would describe it as an attempt to simulate an outdoor hotdog & burger stand inside, down to cardboard food baskets, the paper towel dispenser, and the word “stand” in the name. The thing is that it’s inside a train car, harkening back to the roadside attractions and diners of rural America. I wanted to ask, “Which is it?” Let’s just call it unique. The seating runs along one wall and consists of several tables, each suitable for four or five people. There may be additional outdoor seating; I didn’t check. The question, “Which is it?” was a bit of a theme. The aprons claim to have possibly the world’s best hotdogs and hamburgers, but it seems to me that you can only have one. (In Champaign, the late Taki Iatropoulos managed to meet both of these criteria, but not at the same time - the “possibly-best” hotdogs and assorted sausage-in-bun foodstuffs were from his cart and the possibly-best burgers were from the restaurant he later opened.) This lack of dedication to the burger was evidenced in the ratings and comments (this is a lie - I haven’t seen them as they are still in Tony’s possession): after my burger (which was certainly not bad), I was fairly convinced that these could not possibly be the world’s best burgers (caveat: I made the rookie mistake of choosing a double cheeseburger instead of a 1/2 pound burger). I have no reason to believe that the hotdogs are not among the possibly-best. I was tempted to check, but will instead leave this investigation, and the implications as to whether this place is going for “inside” or “outside” to some enterprising “hotdog tourist”. I was also disappointed in the fries, which lacked an exterior texture.